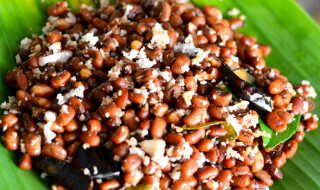 Sundal with raw coconut is a South Indian preparation made with chickpeas and fresh coconut. It’s really easy to prepare and within 20 mins you can serve it as a great side dish. Check out the recipe to learn how to prepare this dish in a snap! Rinse and soak the chickpeas overnight in water. Drain and pressure cook the soaked chickpeas with 1 tsp salt and 3 to 4 cups water till they are soft. Add the mustard and urad dal. Add the curry leaves, red chilies and asafoetida. Add the cooked chickpeas and salt. Stir and saute for 4-5 minutes on a low to medium flame. Add the coconut at last and stir well.